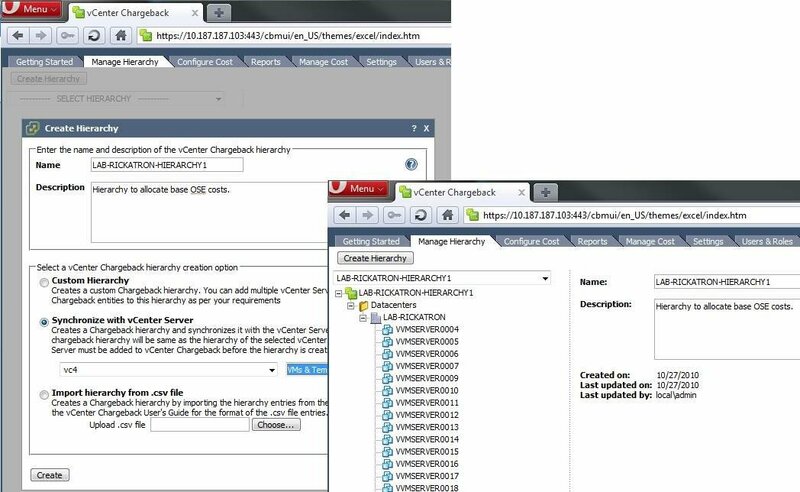 VMware vCenter Chargeback allows administrators to measure virtual infrastructure costs. Once you install VMware Chargeback, you're on your way to building a private cloud. VMware is all about private cloud computing these days, and private clouds require refined cost models and quantified infrastructure costs. A chargeback policy measures the resource use of business units, which includes compute cycles, storage consumption, licensing and other costs. Business groups are then billed for their resource consumption. In a private data center, chargeback can fund an infrastructure without a single business unit absorbing all the costs. In 2009, VMware introduced vCenter Chargeback to aid in this process. The chargeback tool calculates the costs of virtual resources, which helps organizations meet service-level agreements and make sound business decisions. 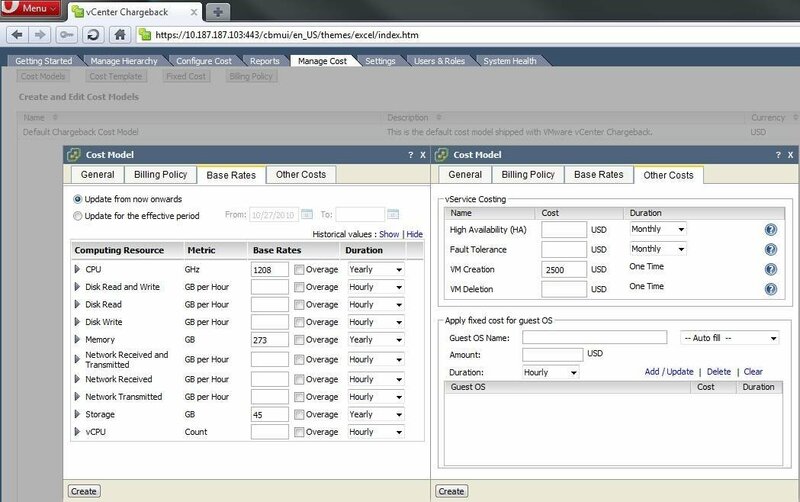 This tip explains how to install VMware Chargeback so you can refine models for measuring infrastructure costs in your private cloud. 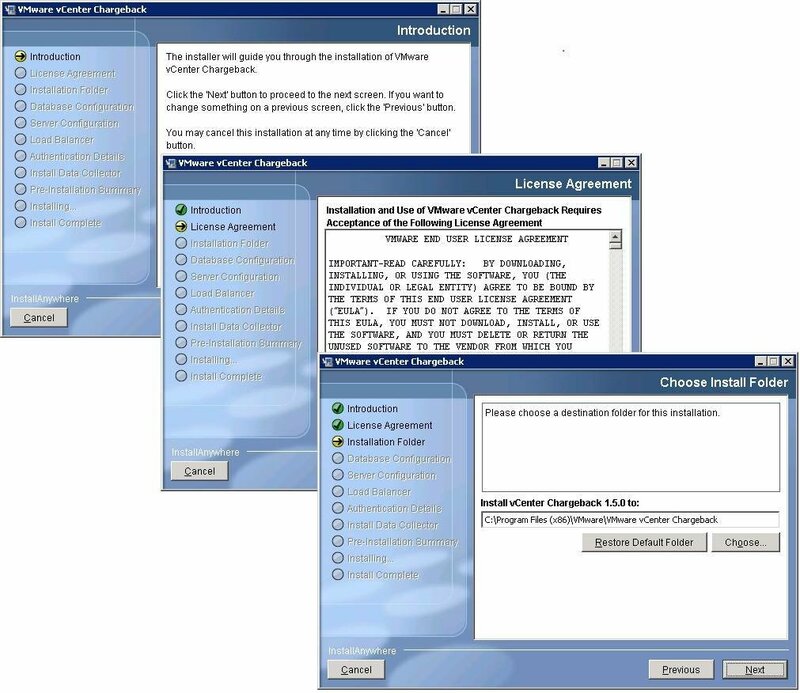 The installation of vCenter Chargeback differs from other vSphere products, such as vCenter Server or vCenter Update Manager. But it's still intuitive. Figure 1 shows the installation process. Like many data center products, vCenter Chargeback requires its own database. It supports Microsoft SQL Server and Oracle database platforms. During the installation of Chargeback, you select the database destination by entering standard information, such as server names and credentials. Unlike other vSphere products, however, the database and username are entered directly to the installation. Chargeback uses a few ports, an instance name and an email address. Later in the installation, these components can be altered, but it provides Chargeback with a base configuration for access and alerting. The installation also sets a local administrator (application only) password and generates a Secure Sockets Layer certificate for the Apache Web engine. 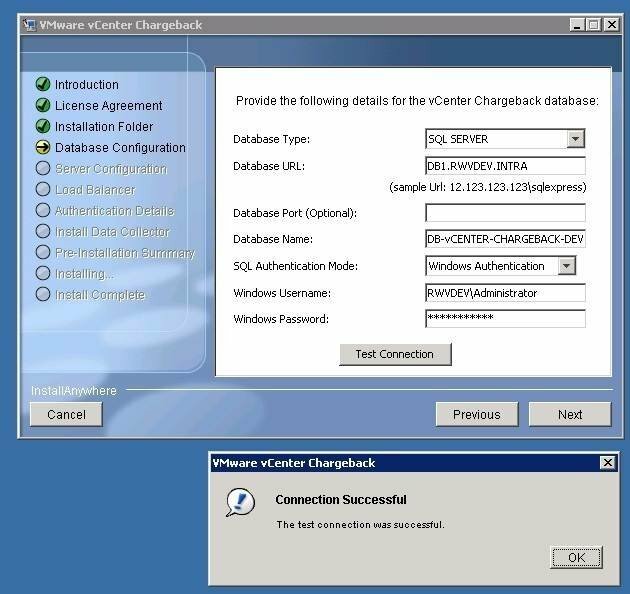 VCenter Chargeback's default installation provides the basic collector , a feature that correlates data between the vCenter Server database and vCenter Chargeback database. Two other collectors are available for vCloud Director and vShield Manager. 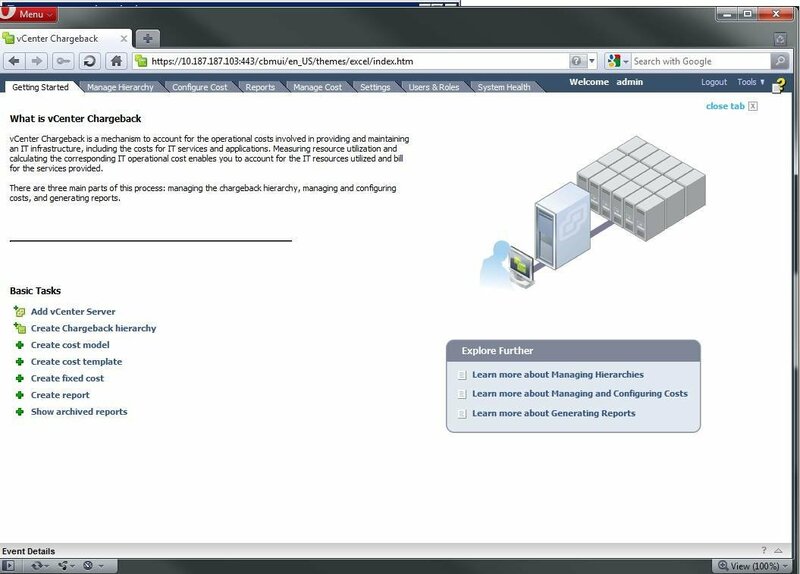 After the installation, logging into the application displays a Web-based representation that's similar to vCenter Server layout. 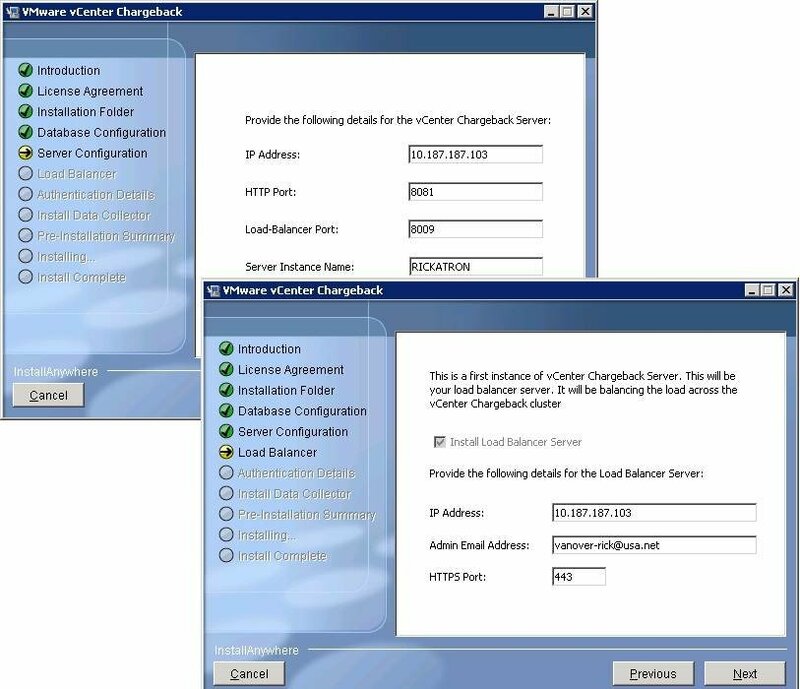 Figure 4 shows an initial vCenter Chargeback screen below. 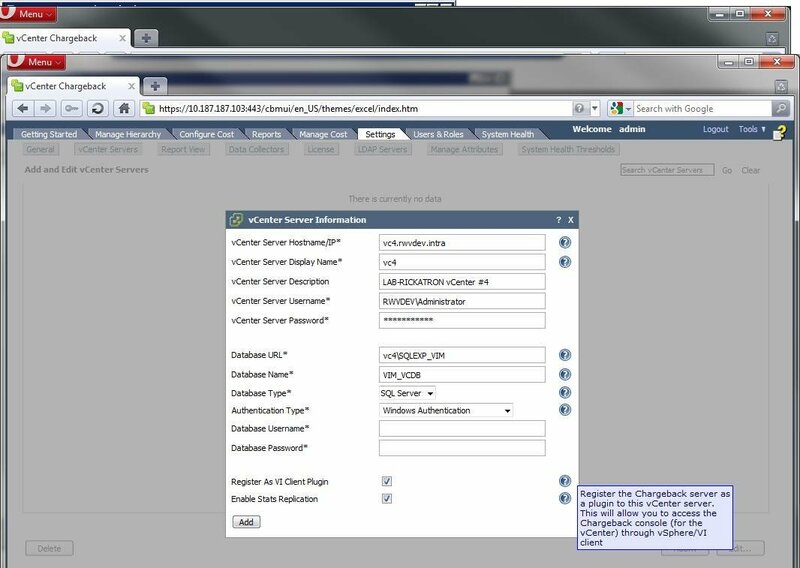 Connecting the VMware chargeback software to the existing vCenter Server is a critical step toward generating usable data. The concept of chargeback hierarchy is fundamental to the product. The vCenter Chargeback users guide defines a chargeback hierarchy as "an organization of vCenter Server entities and vCenter Chargeback entities." In other words, vCenter Chargeback organizes vCenter objects (i.e., hosts, virtual machines, resource pools) as a container or parent, which corresponds with vCenter Server items. 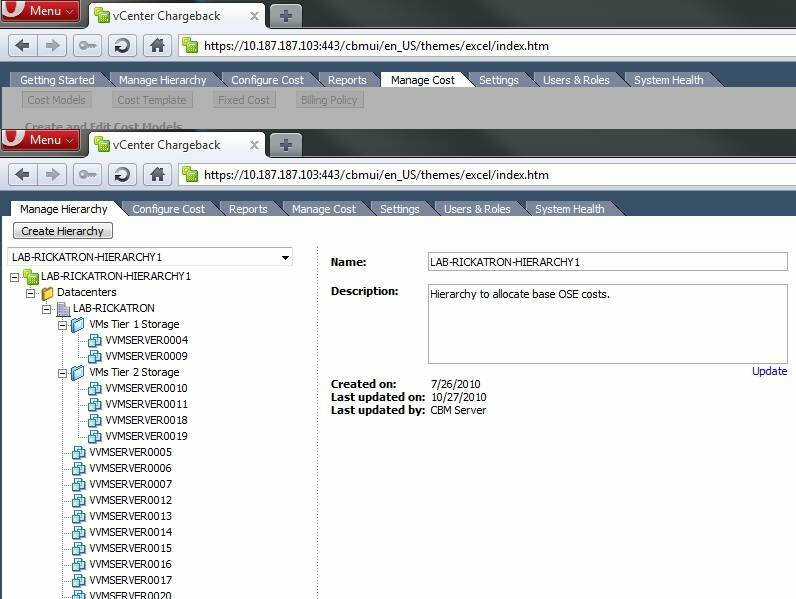 As with other vCenter and vSphere objects, the chargeback hierarchy is a user-created object, and many hierarchies can be created for granular reporting on consumption. The chargeback hierarchy effectively identifies the vCenter Server as a container for more specific costs. I created a sample baseline, LAB-RICKATRON-HIERARCHY, which Figure 6 shows below. Now you can create the key vCenter Chargeback items, such as the cost model. With a cost model, you can calculate direct costs to the measurable elements of a vSphere infrastructure. Note that there are several onetime cost categories as well as costs that can be assigned in different time intervals, including hourly, daily, monthly or annually. Here's an example: I assigned a $1,208 cost to 1 GHz of vSphere processor power. It's based on the server's initial purchase price (and its vSphere licensing) divided by the number of years the equipment is expected to be in service. The same strategy works for memory and storage costs. The first question is, how can we apply a cost model to a tier of storage, because many environments have varying tiers of storage? The costs for tier-one storage can be double or triple (sometimes, even more) per gigabyte than tier-two and tier-three storage. But it depends on several factors. VCenter Chargeback has a tier attribute that's designed for storage tiers, but its granularity may not be flexible enough for administrators. A different approach is to create another hierarchy or cost model with the tier-one and tier-two costs laid out. And then, apply these figures to vSphere folders, as Figure 8 shows below. A standard cost model that is broadly applicable to all organizations is easier said than done. But the options within vCenter Chargeback can factor in a number of costs that are associated with the key virtualization areas. There are many scheduling options that deliver different hierarchies and cost models to various elements of the vSphere infrastructure. Another approach is to report with different cost models (as in the example of tiered storage) within the same hierarchy, which increases reporting flexibility. VCenter Chargeback follows a per-VM licensing model, with pricing starting at $60.52 for each instance. It's also available as a free download for 60 days, but it requires an existing vCenter installation. Creating the elements for a usable set of information can be a challenge. VMware has a one-hour, self-paced course on vCenter Chargeback. The course costs $50, or one Subscription and Support Services credit. The course may be a good idea. It's not an incredible investment, and you may even be able to press your VMware account team for complimentary access to the course. Rick Vanover (vanover-rick@usa.net), vExpert, VCP, MCITP, MCTS, MCSA, is an IT infrastructure manager for a financial services organization in Columbus, Ohio. He is an IT veteran specializing in virtualization, server hardware, operating system support and technology management. Follow Rick on Twitter @RickVanover. Click here for Vanover's blogger disclosure.